Have a Night in The Museum! Spending a night in a London museum is a rare and exciting thing to do. Most aim their sleepovers at children and families but there is an adult option too. Dino Snores is the monthly sleepover for lucky 8 to 11-year-olds at the Natural History Museum. The night includes a torch-lit trail in the famous Dinosaurs gallery and lives animal shows in the evening and morning. But most exciting of all you get to sleep in the Central Hall next to the Diplodocus skeleton, fondly known as Dippy. Good news for the adults: There is also Dino Snores for Grown-ups! As well as enjoying having the Museum all to yourself, the adults get a three-course meal plus live music, a fun quiz, comedy shows and more. You can stay up watching horror movies and enjoy a special midnight feast with an edible-insect tasting. These special Science Museum sleepovers are for children aged 7 to 13 years and larger groups are permitted so there can even be birthday parties and school groups. All get to enjoy some hands-on workshops and science shows before bedtime and there's another activity in the morning too plus a trip to the 3D IMAX Cinema! This could well be the most exciting night of their life so far so don't expect to get a full quota of beauty sleep but do expect to have a really happy group of kids the next day. 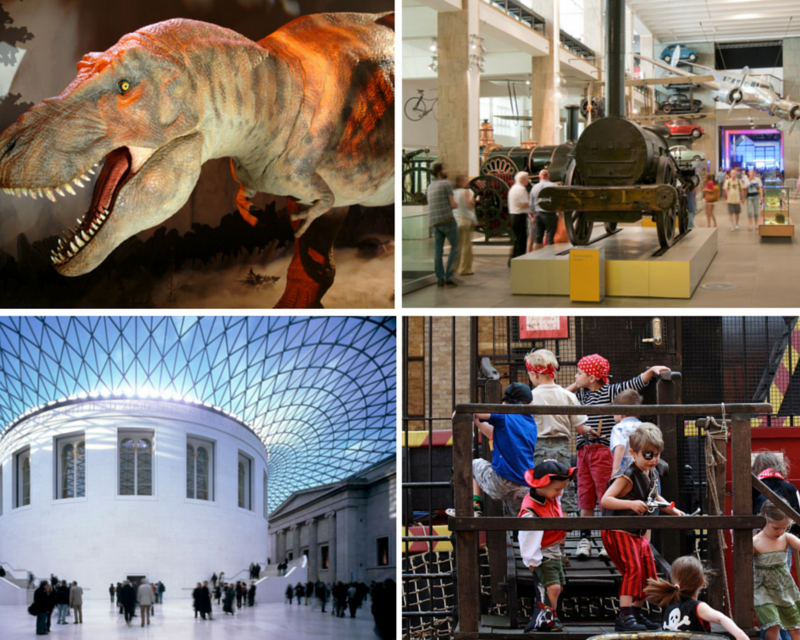 To spent a night at the British Museum you need to become a Young Friend. There are six sleepovers each year and the details are in Remus, the magazine of the British Museum Young Friends. The lucky youngsters must be 8 to 15 years old and they get to sleep in the Egyptian and Mesopotamian Galleries on the Ground floor. Activities run from 7 pm to midnight with lots to discover after hours. Families can sleep overnight on this full-size reconstruction of the ship Sir Francis Drake sailed to be the first Englishman to circumnavigate the globe. Moored on the South Bank, the Golden Hinde provides a unique night where all dress as Tudor sailors and become members of the crew. Sailor Jack and the Captain tell gory tales and conduct barber surgery on the newest recruits before it's bedtime on the Gun Deck. A Tudor dinner and breakfast is provided before you're back on dry land by 9 am. Available from March to October and best for ages 6 to 11 with one adult per group. Bug-tasty fun for 8 to 11-year-olds, you can stay overnight at London Zoo in the BUG House. From 7 pm to 10 am the Zoo is yours - well, for a maximum of 75 people staying for the sleepover - so bring a torch for exploring. In the BUG House, you'll be sleeping next to spiders and creepy crawlies and may well hear the nearby lions outside. This is most children's dream - a night in the best toy shop in the world! Available on Saturday nights from 9 pm to 9 am, the luckiest 6 to 11-year-olds can enjoy a private party on Regent Street at Hamleys. This is a very exclusive event, and that does mean it comes with a hefty price tag, but it sounds utterly wonderful. Children arrive in a stretch limousine where they will be ushered down the red carpet for a sparkling orange juice reception. After a VIP tour of the store, they have a Hamley's photo shoot, an exciting sleepover supper, a personalized cake, a sweet shop stop and a treasure hunt. This is followed by 'Midnight at the Movies' than milk and cookies before bedtime.